The last week of March 2011 could not have been a good one for Rebecca Black, being as she was the most vilified pop star on all the Internet. The amusingly amateurish clip for the 13-year-old’s song “Friday” – an out-of-nowhere, Auto-Tuned sensation featuring feel-good lyrics about the day between Thursday and Saturday – had just overtaken Justin Bieber’s “Baby” as the most hated YouTube video of all time, registering nearly 1.2 million dislikes. By then, numerous bloggers already had dubbed “Friday” “the worst song ever” – a downright polite assessment in light of some of the vitriol directed at Black – and the video had been mercilessly parodied online. 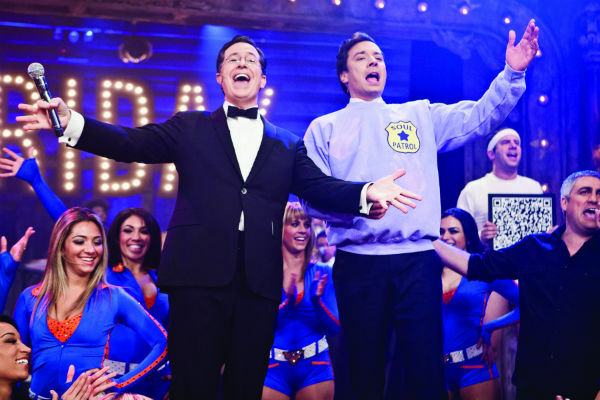 At the end of that same week, comedian Jimmy Fallon had friend and fellow late-night host Stephen Colbert on his show to perform “Friday” with Fallon’s house band, The Roots. But it’s not Jimmy Fallon’s style to pile on, to kick people when they’re down. If Rebecca Black was watching Late Night With Jimmy Fallon that Friday night (or afterward, on the Internet), she ought to have been heartened by what she saw. Everyone involved in the production – and it was nothing if not a production – took the song’s “fun, fun, fun, fun” lyric to heart. “The performance was so balls-to-the-wall,” Colbert says, “just throwing everything at the canvas.” Jackson Pollock would be so dizzied: “Everything” included (but was no means limited to) onstage pyrotechnics, a surprise appearance by former American Idol Taylor Hicks, and for good measure, somebody boogieing in a yeti costume. Oh, did we mention that the Knicks City Dancers showed up, too? It’s that absence of sharp objects on the set of NBC’s Late Night With Jimmy Fallonthat differentiates the show from so much of today’s snark-filled television landscape – and made it a safe space for a serious artist like Eddie Vedder to duet on a Fallon original called “Balls In Your Mouth.” (Hey, quit snickering: It’s a protest song about the tar balls from the BP oil spill.) Or for Bruce Springsteen to dress up as a ’70s version of himself (black-leather jacket, funky cap, fake beard) to perform Willow Smith’s tween-pop hit “Whip My Hair” with Fallon, himself playing ’70s-era Neil Young. Or for President Barack Obama to “Slow Jam The News,” advocating for low student-loan rates over a sultry groove laid down by The Roots.